Location: Firth of Clyde, Inverclyde, Scotland. Notes: Ardgowan Castle, also known as Inverkip Castle, is located in the grounds of Ardgowan House near Inverkip, Scotland. It is by the Firth of Clyde in Inverclyde, in the former county of Renfrewshire. The three-storey ruin is protected as a category B listed building. 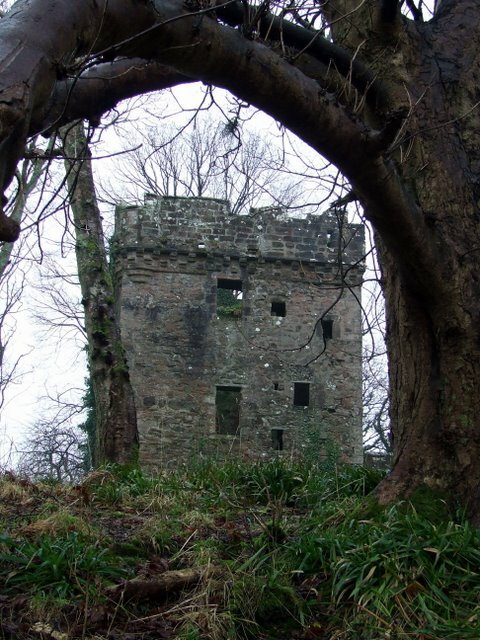 In 1306, Inverkip was besieged by supporters of Robert Bruce, led by Robert Boyd of Cunningham. In 1403, King Robert III granted the lands of Ardgowan to his natural son, Sir John Stewart. The castle is dated to the late 15th century. In 1667 Archibald Stewart was created a baronet. The 3rd baronet married, in 1730, Helen Houston, heiress of the Shaws of Greenock. Their son Sir John Shaw-Stewart, 4th Baronet, commissioned a design for a new house from the architect Hugh Cairncross. Construction began in 1797, and was completed around 1801, after which the old castle was abandoned. The ruin was consolidated and repaired in 1936.